One of the biggest mysteries in the oil market surrounds just how much oil Iran is hoarding at sea. That's a key question because Iran's nuclear deal with the West could lift crippling sanctions, and pave the way for tons of Iranian oil to hit the market. A surge in Iranian exports would only deepen the oil supply glut that has sent prices to fresh six-year lows this week to below $43. Iran claims it's not stockpiling oil in tankers in the Persian Gulf, but no one believes it. Up until recently, energy experts thought Iran's vessels held 30 million to 40 million barrels of oil. But maritime surveillance firm Windward has harnessed sophisticated technology to determine Iran is actually hoarding 50 million barrels of oil. That's up nearly 150% from April 2014 when Windward started tracking this closely-watched metric. Based in Israel, Windward uses Big Data to track oil held on all ship classes and vessels in the Gulf, including those that do not transmit their location. The larger estimate of Iran's floating oil stockpile is more evidence that the world has far more oil than it needs, especially given the slowdown in demand and turbulence in China. "That means when sanctions are lifted, there is going to be a flood of crude hitting the market because boy could they use the money," said Tom Kloza, chief oil analyst at the Oil Price Information Service. It's important to remember the oil hiding at sea is ready to be shipped to a buyer -- likely in Asia -- at a moment's notice. It's already been pumped out of the ground, cleaned up and processed. "Iran has been trying to downplay what they have in floating storage because they don't want those figures to spook the market," said Tamar Essner, an energy analyst at Nasdaq Advisory Services. But first Iran needs to comply with the nuclear deal that still needs to be ratified by Congress. The landmark pact faces deep skepticism in Congress, but lawmakers may not have enough votes to override a promised veto by President Obama. 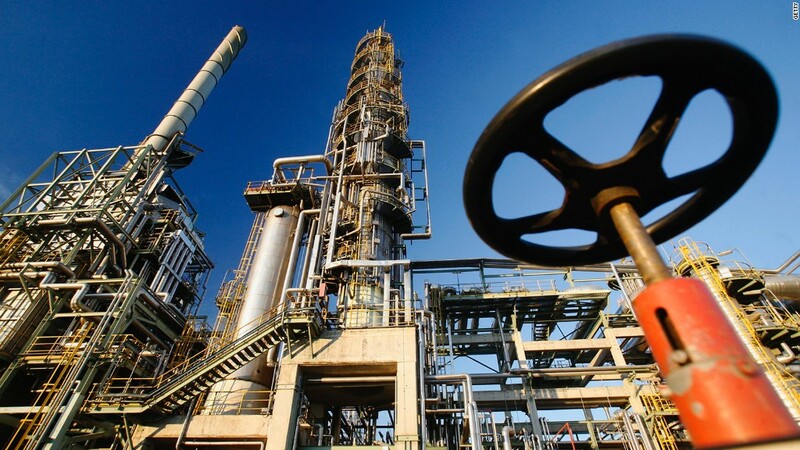 If the sanctions are lifted, Iran will be able to put an additional 375,000 to 500,000 barrels of crude on the market by mid-2016, according to RBC Capital Markets. "Iran is our turnaround story of the year as it is poised to emerge from decades of economic and international isolation," Helima Croft, head of commodity strategy at RBC, wrote in a research report. 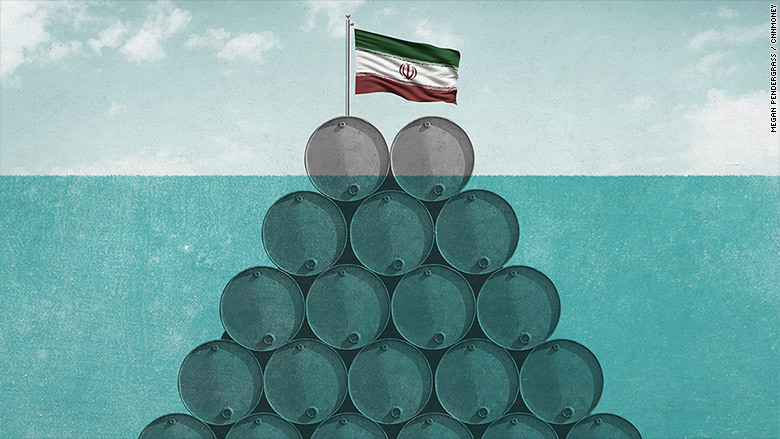 "Unlike for most OPEC countries, the future is looking brighter for Iran." There remains confusion over Iran's oil stockpiles. While Windward's surveillance has indicated the huge stockpiles of oil that Iran is hiding at sea since early June, other forecasters have estimated a lower amount. Now they are ratcheting up those guesses. Platts said Iran is storing as many as 53 million barrels of oil and condensate at sea, up from a previous estimate of 40 million to 42 million. That includes one tanker operated by the state-owned oil company that reappeared in the Iranian port of Assaluyeh after having its transmitter switched off since September, Platts said. The firm also said three other tankers "remain invisible" but are likely attached to the group. The debate over how much oil Iran is stockpiling highlights a common problem in the oil market: No one trusts the data. Much of the time the official statistics are self-reported by countries that have an incentive to fudge the numbers. "Everywhere we touch, we see that official numbers are very different from real numbers, either up or down. Nobody knows what goes where and how much," Windward CEO Ami Daniel told CNNMoney. Windward's maritime surveillance stats are exclusively used by foreign intelligence services searching for terrorists and contraband. However, now hedge funds and Wall Street banks, always hungry for a trading advantage, have been in talks with Windward over providing access to its platform. "There's no real clarity in international oil data. It's got the precision of cutting your hair with a chain saw," said Kloza.